SINGAPORE - In the heart of Singapore's Marina Bay district, a new gleaming complex of steel and glass soars. 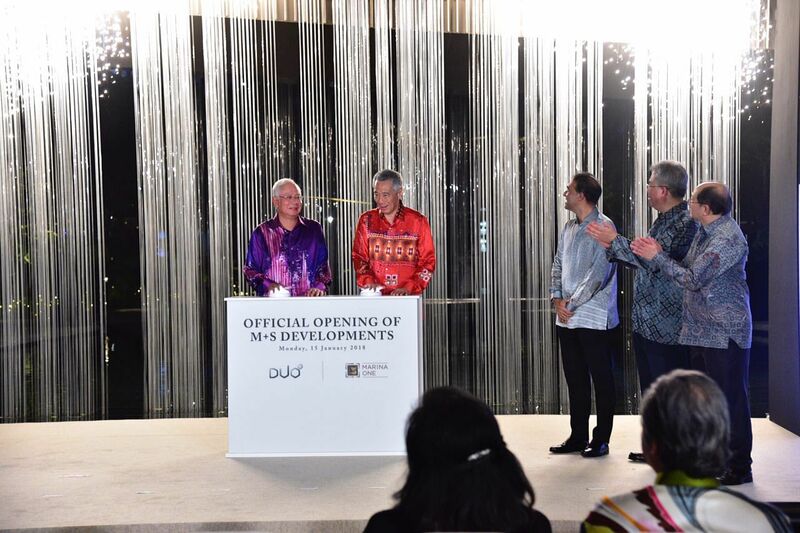 On Monday (Jan 15) evening, Marina One was officially opened as Singapore Prime Minister Lee Hsien Loong and Malaysian Prime Minister Najib Razak looked on. The 30-storey development is the product of a historic pact between Singapore and Malaysia in 2010, one that comes after 20 years of impasse during which the two neighbours wrangled over plots of railway land in Singapore that Malaysia had previously controlled. Eventually, in return for those three plots and three additional plots in Bukit Timah, Singapore offered four parcels of land in Marina South and two parcels of land in Ophir-Rochor for development. M+S, a joint venture company by Malaysia's Khazanah Nasional and Singapore's Temasek Holdings, developed Marina One and Duo on those land parcels. Both are integrated developments that include office, residential and retail spaces. M+S chairman Azman Yahya said: "We hope that these two developments will serve as lasting, visible symbols of the harmonious bilateral ties shared between our two countries for future generations." The mixed-use developments have a combined gross development value of $11 billion. 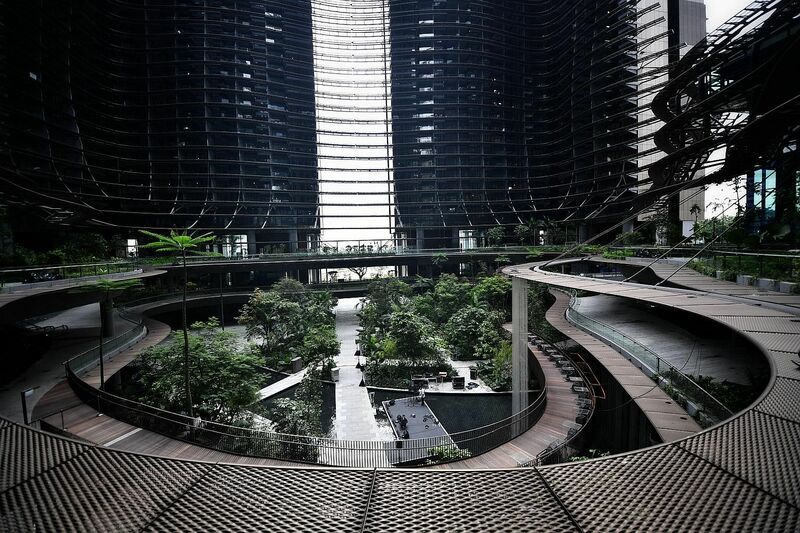 Marina One's tenants include Swiss private bank Julius Baer and consultancy PwC Singapore, while Duo houses Andaz Hotel Singapore, a five-star hotel brand by Hyatt. Datuk Seri Najib, who arrived in Singapore on Monday, attended the opening of Marina One and Duo ahead of the 8th Singapore-Malaysia leaders' retreat with Mr Lee on Tuesday. He also called on President Halimah Yacob at the Istana for the first time since she took office, and will be hosted to a private dinner by Mr Lee and Mrs Lee. Singapore and Malaysia's prime ministers have held leaders' retreats almost every year since Mr Najib came for an introductory visit in 2009. The 8th retreat, originally scheduled for last month, was postponed at Mr Najib's request due to a special meeting of the Organisation of Islamic Cooperation in Turkey to discuss the United States' move to recognise Jerusalem as Israel's capital. The prime ministers and their delegations will meet for bilateral discussions on Tuesday as part of the leaders' retreat. They will also witness the signing of a bilateral agreement for the Johor Baru-Singapore Rapid Transit System (RTS) Link, by Coordinating Minister for Infrastructure and Minister for Transport Khaw Boon Wan, and Malaysian Minister in the Prime Minister's Department Abdul Rahman Dahlan. "The RTS Link will help to boost connectivity, strengthen our economic and business links, and enhance people-to-people relations," said Singapore's Ministry of Foreign Affairs in an earlier statement. It added that the leaders' retreat is the key platform for both leaders to review progress in bilateral ties and set the direction going forward. Singapore's delegation includes Mr Lee, Deputy Prime Minister Teo Chee Hean and other Cabinet ministers such as Mr Khaw and Foreign Minister Vivian Balakrishnan. Mr Najib was accompanied by a high-level delegation that includes Malaysian Foreign Minister Anifah Aman, Transport Minister Liow Tiong Lai, and International Trade and Industry Minister Mustapa Mohamed.